Use this chart to locate the galaxies of autumn. As Earth moves in its orbit around the sun, new constellations are revealed in the east as the old ones disappear into twilight. The bright stars of Orion and his winter companions will soon replace the duller stars of the Summer Triangle. During this period of transition, we find ourselves looking outwards from our own galaxy into intergalactic space, making it one of the two best times of the year to hunt for galaxies. After twilight falls, look eastward to see the Square of Pegasus, formed by four second-magnitude stars about the same brightness as the stars of the Big Dipper. As the Square is rising in the east, it will appear more as a diamond than a square. The leftmost star of the diamond, Alpheratz, marks the head of Andromeda. Two streams of stars extend to the left from Alpheratz, pointing towards Perseus, just below the "W" shape of Cassiopeia. These constellations provide the framework of relatively nearby stars in our own galaxy, the Milky Way, through which we look locate our neighboring galaxies beyond. Most people have never seen another galaxy. In fact, most people today have never seen the galaxy in which we live, because the widespread glow of light pollution blocks the Milky Way's faint light. To locate our nearest galaxies, look for the middle star in the lower chain of Andromeda, Mirach. Just above it is a fainter star in the upper chain. Draw an imaginary line from Mirach to this second star, and extend it the same distance. This will take you to the Andromeda Galaxy. What will you see? With the unaided eye, probably nothing, unless you are at a very dark location. However, with ordinary 7x50 or 10x50 binoculars, you will see a tiny faint glowing cloud. Oddly enough, if you point a telescope at this cloud, you will probably see less than with binoculars. This is a case of less being more: the wide field of view of the binoculars sets off the view of the Galaxy perfectly. This faint glowing cloud may not seem impressive, until you realize that its light has been traveling for more than 2 million years to reach your eyes. When that light began its journey, our ancestors were just a bunch of small primates wandering on the plains of Africa. Go back to Mirach and its companion, but this time follow the line in the opposite direction. 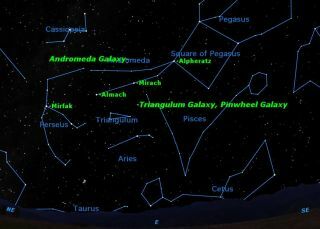 This will lead you to an even fainter cloud, the Triangulum or Pinwheel Galaxy. This is a smaller galaxy than Andromeda, but located at about the same distance from us. Even though this is one of the brightest and nearest galaxies in our sky, it is unusually difficult to see. That’s because it is almost at right angles to our line of vision, so we are seeing it in plan view. As a result, its feathery edges blend into the background, and we have no sharp edge to catch our eye. Usually you need binoculars to see the Triangulum Galaxy, but sharp eyed observers at very dark locations have managed to see it with the naked eye, making it the farthest object that the human eye can see unaided. This article was provided to SPACE.com by Starry Night Education, the leader in space science curriculum solutions. Follow Starry Night on Twitter @StarryNightEdu. Follow us @Spacedotcom, Facebook and Google+. Original article on SPACE.com.